You may have noticed the excavations carried out by a family of badgers on the bridleway, the section that runs parallel to the lake, between the Trafalgar hedgerow and the plantation. Several holes have been dug and at least one tunnel now goes under the bridleway. 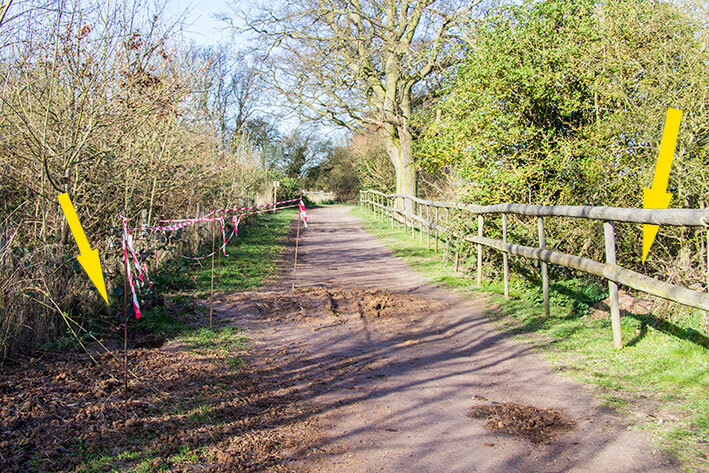 Horse riders are asked to take particular care when using this part of the bridleway at the moment. Please note - there has been some confusion - riders are NOT being asked to dismount and walk their horse past the badgers' site. This would be very dangerous on the narrow bridleway and without a mounting block many riders would not be able to remount. A diversion will be put in place and the area will be strengthened. At the moment the plan is to put metal road plates in place over the tunnels just below the surface of the bridleway. In the meantime, take care everyone.